Pain during menstruation can indicate blood stagnation, blood deficiency, and cold in the uterus. Clotting: Regulate spleen, liver, and kidney. Gently move qi and blood. Throbbing headache may be related to liver yang rising. Subdue liver yang, nourish yin. Dull headache during or after is related to qi and blood deficiency. Strengthen spleen, build blood and tonify qi. c) Balance good quality yin hormones. *Environmental estrogen (xenoestrogens) found in food and self care products can disrupt quality yin. Short: Nourish blood, tonify yang. Watery: Tonify spleen, kidney, and drain damp. Diarrhea: Tonify spleen and kidney yang. Dizziness and fatigue post-menses. Strengthen the spleen, nourish liver blood, and kidney yin to replenish blood, fluid, and tissue that was sloughed off in phase 1. Pain during ovulation. Resolve damp-phlegm in lower jiao, tonify spleen and kidney. Lack of ovulation. Tonify kidney and nourish essence. Open the governing vessel (du mai). 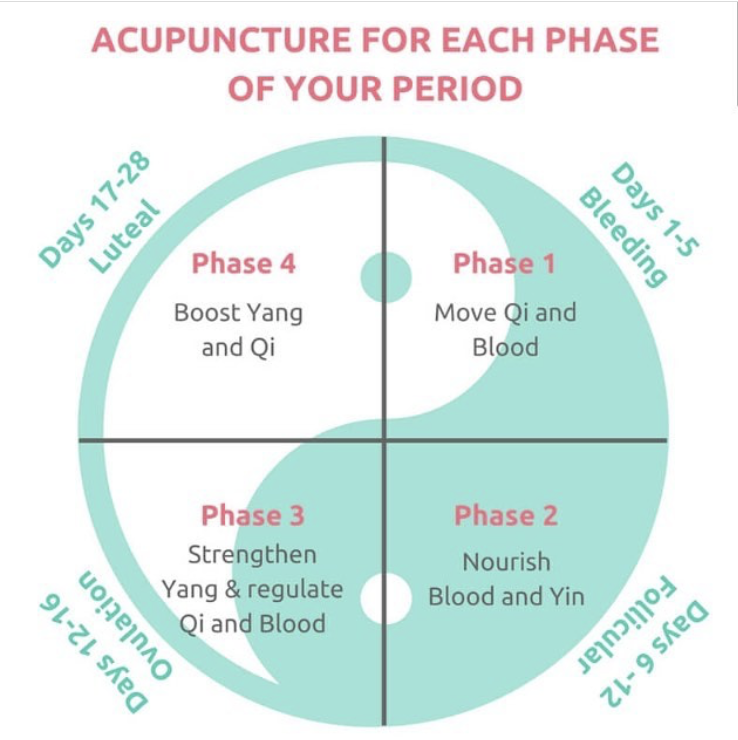 Tonify yang energy to promote movement and to warm the uterus and meridians, which facilitates ovulation and conception. If period is usually early. b) Tonify spleen yang qi to hold blood. d) Nourish kidney yin or firm kidney qi. a) Invigorate qi and warm the uterus. Alternating between early and late. a) Tonify spleen to hold blood in blood vessels and/or to produce blood. b) Soothe liver qi and blood (emotions affect liver and smooth flow of qi and blood). c) Nourish liver and kidney yin. Soothe liver qi to prevent cramping and headache prior to period and to prevent additional PMS signs and symptoms. If bloating is present move liver qi and tonify spleen. Open the girdling vessel (dai mai) to open and relax energy in the hips, which helps prevent cramping.